1 Burning Question: Will Chuckie Keeton manage to stay healthy in 2015? The return of quarterback Chuckie Keeton last season may have been a tad rushed, a thought that is supported by the shutdown of the key offensive player after appearing in just three games and battling knee concerns. His return to the field is one of the big stories to follow in the Mountain West Conference this season. 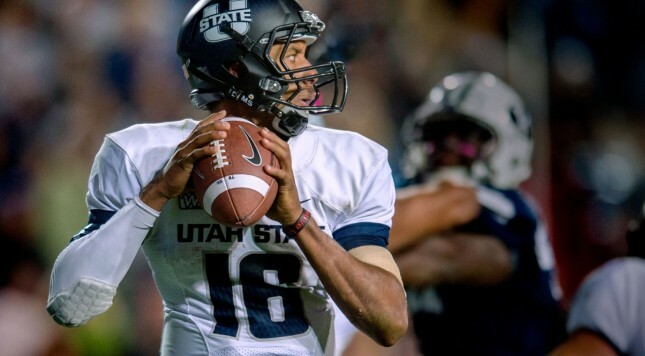 Keeton is returning for his fifth and final season of eligibility at Utah State, with the goal of bringing a Mountain West Conference championship to the Aggie program. It would be appropriate to see this program celebrate a conference crown with Keeton leading the charge, because he has been one of the top players in the program, one worthy of some national recognition. Keeton has battled knee injuries each of the past two seasons, but Utah State has managed to keep chugging along. The program has done well, but Keeton’s absence has mattered — it is realistic to say that it has held back the Aggies from capturing a conference crown. If he can stay on the field this fall, Utah State can make a legitimate run at Boise State for the Mountain Division crown, which would give the Aggies a shot at the conference championship. History may be against Keeton, but this could be a fitting end to his collegiate career if his knees cooperate. 10 – Average number of wins per season over the last three years. There is something to be said about consistency, and Utah State has managed to be one of the more consistent winners over the past three seasons. This despite key injuries on offense. Each of those seasons has ended in a bowl victory under head coach Matt Wells, who replaced Gary Andersen, the former USU boss who accepted a job offer at Wisconsin and just relocated to Oregon State. 49 – Number of sacks by Utah State’s defense in 2014. Only two teams in the country had more sacks last season than Utah State (Utah and Washington). One of the biggest reasons for Utah State’s success in recent years has been the performance of the defense, and it is clear the front of the defense is bringing pressure and causing problems for opposing quarterbacks. This season though, Utah State loses its top two sack masters, B.J. Larsen and Zach Vigil. Fortunately, Nick Vigil is still there to lead the way in the backfield. Why it Matters: After getting a bye week to figure out what works and what needs improvement after taking on Pac-12 foes Utah and Washington, the Aggies open up conference play at home against one of the better teams from last season, Colorado State. These two played a tight one last season, and it could be another close one again this October. Why It Matters: Without a doubt, Boise State has had the upper hand on UItah State for about as long as they have been playing each other, going back to the days of the old Big West and WAC before becoming Mountain West Conference division rivals. The Broncos are poised to once again be the team to beat in the MWC, and knocking them off is difficult to do. Utah State will be coming off two tough conference games against CSU and Fresno State, which means this could be a pivotal game in the division race. Why It Matters: Air Force is a team capable of upsetting anyone in the conference, and is coming off a surprisingly good season in 2014. The running game should be a good test for Utah State’s defense. With the game coming on the road and a potential division title riding on the outcome for Utah State, depending on what happens earlier in the season, this could be a bad spot for Utah State. Chuckie Keeton, QB – At this point there is not a whole lot more to say about Keeton. If healthy, Keeton will be able to beat most opponents with his arm or his legs, and the efficiency with which he does will be difficult to slow down. However, he has to stay healthy first. Nick Vigil, LB – Vigil is Utah State’s top tackler returning this season, and as mentioned above he is known to record some sacks as well. The outside linebacker will be all over the field defensively this fall, and he may even get a chance to carry the football at times. LaJuan Hunt, RB – As a freshman in 2014, Hunt led the way on the ground. Hunt passed senior Joe Hill for the team’s rushing lead with 545 yards on 110 carries (average of 4.95 yards per rushing attempt). His breakout performance came in a game at Hawaii, where he rushed for a season-high 150 yards. Vigil can make big plays, as he forced five fumbles last season. Hunter Sharp, WR – Sharp was Utah State’s leading receiver in 2014 with 939 yards and seven touchdown receptions in 14 games. This year the senior should once again be the biggest target for Keeton, and he should rack up some big numbers once again for the Aggies. Sharp’s production will be important after Utah State dismissed JoJo Natson recently. Natson was the second-leading receiver in 2014, and a core contributor on special teams. 5. Chuckie Keeton stays healthy for the full season. After seeing each of the past two seasons cut short by injuries, it would be nice to see Keeton get through the year without having to receive serious medical treatment, and play in a bowl game. Whether that means winning the Mountain West Conference or not, the college football world will deserve one final game by Keeton in the bowl season. And, of course, so does he. 4. Utah State earns a Pac-12 split. Utah State gets a crack at a pair of Pac-12 programs early in the season in non-conference play. In week 2, Utah State travels to Salt Lake City to take on Utah on a Friday night primetime matchup on ESPN2. The following week USU takes on Chris Petersen and his Washington Huskies. It’s a couple of tough road battles against a couple of programs on the rise in the Pac-12, and one could easily see Utah State jumping into conference play with a 2-1 record. The Aggies won’t, though, because Utah State is going to find a way to win one of those two games. If they had to choose one game to win, Utah State would probably prefer it be against Utah for in-state bragging rights, but Washington may end up being the more vulnerable and likely of the two to lose to the Aggies. 3. A fourth straight season ends in a bowl victory. Utah State is not likely to make a run for the New Years Six, and Boise State still ends up standing in the way to the conference championship game, but Utah State will go bowling and end the season on a high note. Where that bowl game is and who the opponent is remains to be seen, but Utah State’s senior class will go out never having lost a bowl game. 2. Utah State gives Boise State its biggest challenge in conference play. As I have alluded to on multiple occasions in this preview, Boise State looks to be the top team in the Mountain West Conference in 2015, and the Broncos should continue to flex some muscle at home on a Friday night against the Aggies. However, the Aggies will present Boise State its biggest challenge in conference play this season, and potentially make the Broncos sweat in the fourth quarter. Boise State comes out a winner, but by a much closer margin than last year’s blowout. 1. Nick Vigil wins Mountain West Defensive Player of the Year. Last year it was Zach Vigil winning Mountain West Conference Defensive Player of the Year. This year it will be his younger brother, Nick. I have not gone through the record books to check, but I would go out on a limb to say this may be the first time brothers have won any conference’s individual award in consecutive seasons.